One of the only women journalists in Myanmar, Aye Aye Win works under the repressive military junta in her country. Win, 54, is a correspondent for the Associated Press in Myanmar, formerly known as Burma. In order to avoid standing out as a journalist, Win occasionally wears clothes to blend in with people in different regions. Additionally, during a demonstration in 1996 when Win was covering a student protest, she changed her hairstyle so that she could not be recognized. This allowed her to evade security and cover the event. Win has been called “the axe-handle of the foreign press” by other media outlets in Myanmar because she has helped open the door for foreign journalists to report on the country. Her movements are closely monitored by authorities; her house is periodically staked out by plainclothes police or military intelligence agents, and her telephone is often tapped. She has been harassed numerous times by authorities and was interrogated in 1997 and 1998, when she was taken to the local military intelligence office. Win was not tortured physically, but because the interrogations occurred late at night, she said being summoned was especially unnerving and traumatizing. Win has also been threatened by the state-owned press, which usually carries articles or commentaries that reflect the views of the government. The official New Light of Myanmar newspaper issued a “last warning,” implying that she should cease reporting or they would kill her. The newspaper never mentioned Win by name but referred to her as a female “axe-handle” who works for a Western news media organization. Because she was the only woman journalist working for a foreign news agency, Win knew this threat was meant for her. Win is known to argue with authorities who criticize her, but she says that as long as she remains accredited as a correspondent she will tell all sides of the story. For example, when pro-democracy leader Aung San Suu Kyi was travelling around the country in 2000, few journalists dared to follow. Win joined Suu Kyi until she was barred from continuing. She was approached by two plainclothes police officers who recognized her and stopped her from crossing the river and following Suu Kyi. When dissidents and members of Suu Kyi’s party were arrested, Win sought details about the arrests from their family members even though they were watched by secret police. These activities put her high on the “watch list” of the authorities. In the fall of 2007, Win put herself in great danger by covering violent demonstrations against the military government in Rangoon. She did not do this from the relative safety of her home or even a hotel room overlooking the protest sites as many journalists did; instead, she walked the streets while soldiers were firing at marchers and beating up innocent bystanders. Win’s father, U Sein Win, was also a reporter in Myanmar; he was imprisoned three times in his pursuit of press freedom. It was during one of his stints in jail, in 1988, that Aye Aye Win stepped in to cover a pro-democracy uprising. She learned about journalism from her father and joined the AP a year later. 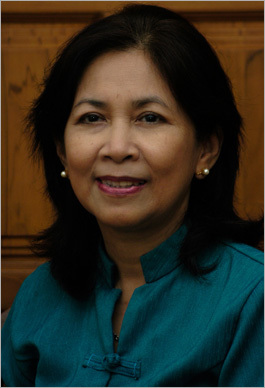 Win was first noticed by the government early in her journalism career – around 1989 – because she was the only woman journalist in her country. She became a target of the government in 1995 when she began to cover more political stories after Aung San Suu Kyi was released. There was a lot of tension between the government and Suu Kyi, and covering her political activities and the anti-regime protests became more dangerous. Win’s husband, also a journalist, is also often heavily targeted by authorities. During a protest against economic hardship that erupted in Rangoon in August 2007 after the government raised fuel prices, Win’s husband was taken away and held in solitary detention for six days and questioned about his work as a journalist. Win had no word on his whereabouts, but she steadfastly covered the story, risking possible detention, imprisonment and even her own life. In 2004, Win was honored by the Associated Press with the Oliver S. Gramling Journalism Award. Win was born December 20, 1953, in Yangon, Myanmar. Aye Aye Win is the first Courage in Journalism Award winner from Myanmar.